Fall is in the air and pumpkins adorn porches around our neighborhood's... and the October Visiting Teaching Gifts that we have created for you will fit right in as you go and visit the sisters you are assigned to. A pinstriped box is filled with a mixture of caramel and almond chocolate kisses, along with the message from the Ensign. 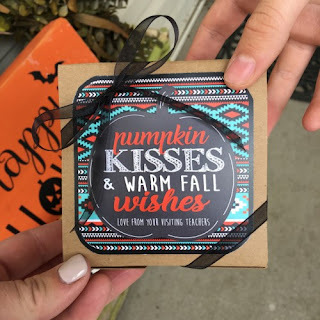 The tag on the outside says, "Pumpkin Kisses and Warm Fall Wishes - Love from Your Visiting Teachers"
Ribbon may vary from picture but be assured it will always be darling! "Becoming True Disciples" is the title of the Home Teaching Message from the October 2017 Ensign. 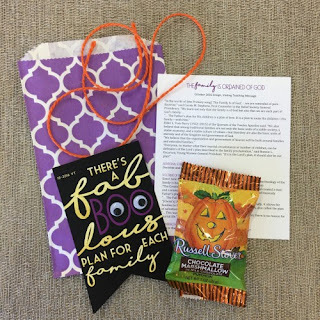 We have created a gift that includes the full message from the Ensign, a package of pumpkin mellow candies, and the cutest little story about how God helps "carve" us into the disciples He knows we can be. Two words: Chocolate Marshmallow! Who wouldn't want this scrumptious Russell Stover treat delivered to them this month? 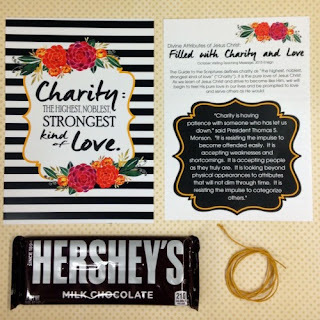 Our fabulous visiting teaching gift is now available complete with the message (Family is Ordained of God) and of course wrapped up in classic Pioneer Party packaging that is sure to bring a smile to your sisters! Sack is approximately 5"x7" and will come in black or purple. The tag reads "There's a Fab-BOO-lous Plan for Each Family" Ready for a SPOOKTACULAR Family Home Evening? Use this adorable "Don't Eat Pete" game to teach your kids about obedience while snacking on some yummy candy corn. This month's home teaching is a fun and educational choice for the entire family! Fall is here and with that we have created this month's Visiting Teaching Gift so that you and your sisters will be able to add a new decoration to your home. We have designed a 5"x7" print with the quote "Charity: The Highest, Noblest, Strongest kind of Love." It will fit perfectly in a frame and is designed with beautiful fall colors. The message from the Ensign is entitled, "Divine Attributes of Jesus Christ: Filled with Charity and Love." We also loved a quote from President Thomas S. Monson... so we included the full message from the Ensign and high-lighted that quote for your sisters. (see images) Of course no Pioneer Party gift is complete without a treat - so a yummy milk chocolate Hershey bar is tucked in as well. Enjoy the beautiful fall weather and this darling Visiting Teaching Gift!